Got a new crab, didn’t know a thing and had him in calcium San/eco mix wet as per pet store. Realized that was wrong and got play sand ASAP. Ran out of salt water conditioner so wasn’t quite at sandcastle consistency. He also switched to a new shell that I think may have been a bit too big but it was all I had atm besides his current hole filled one. Crab dug down that night before I could get more saltwater. Been buried since. Only thing he did before going down was absorb a small dish of saltwater. Pretty sure he never touched any food. Been buried for about a week. Last I saw him was second day of being buried when he was under but against glass. Dug away from that spot and tunnel refilled behind him. I’m worried the sand isn’t wet enough and it’s collapsed on him or he’s trying to molt without storing enough nutrients. Or his too big shell bogged him down. I poured/misted some more sw on the substrate but am afraid to try to mix it up to get correct consistency in fear of harming him as I have no idea where he is now. Advice please? Wait a month ad see if it’s dead? My only crab in that habitat. He’s just smaller than golf ball. 10 gal tank. There’s enough sub...7 inches. 5:1 mix sand/eco. And temp/humidity stays at 80/80. Always use water conditioner/saltwater conditioner. Boiled everything before adding it. Re: Dug down without eating. Molting? I don't think I would be too worried about him. Usually within a few days of coming home they will dig to molt or to de-stress. It's always hard to judge how long they were deprived of being able to dig, or molt. For as much as you want to check on him, don't. Digging him up can do more harm than good. 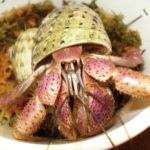 Every crabs molt time varies and is unpredictable. At golfball size I would guess he can easily be down somewhere around 30 days. We received 3 rescue crabs last April that were in a 10 G with a thin layer of aquarium gravel. As soon as we switched them into a tank with substrate one instantly began to dig and disappeared. The other two stayed up for a day or two then they both dug down too. Then I didn't see them. It took then over 50 days for the first one to resurface! They all eventually came back up on their own. it just took a lot of time! I would refrain from a lot of misting with him down. Water can quickly build up at the bottom of the tank from it. As long as you have humidity at 80% or above he should be fine. Only mist to bring the level up if it drops below 80%. Keep in mind that salt does not evaporate! So whatever you use in the substrate stays there. Saltwater should really only be used once to mix the substrate at the very beginning, and then very occasionally used to spray only if there are mold problems. Everything else used to rewet the substrate needs to be freshwater! I’m am glad to hear similar experiences! I will just keep my fingers crossed I guess. Yeah, I only misted with salt water a little when I added more to try and correct the consistency. When drizzling more in from a pitcher it wasn’t really dispersing well so I missed a little as well. Since then it’s been regular dchlorinated water. I don’t notice any puddling of liquid at the bottom of the tank so I don’t think I overdid it. The water conditioner I have is API Water Conditioner...I got it at the pet store the day I got him. It says it does chlorine chloramines and heavy metals. The saltwater conditioner was at first using the water conditioner and adding hermit crab soaking salt that I also got Day I got the crab. But when I ran out of that I bought Flukers Saltwater concentrate and water conditioner combination to finish off the substrate.